“Mary Poppins” kicks up her heels, flies through the sky, and brings joy to the Banks’ family in Berkshire Theatre Group’s 10th Annual Community Theatre production, to take place on the stage of the Colonial Theatre. This community event brings together children and adults who have learned from each other all in the midst of collaboration and creativity. One of the creative leaders of this production is musical conductor Mark Gionfriddo. Mark Gionfriddo, a native of Holyoke, is well known as an accomplished pianist, accompanist, composer, arranger, and musical director. He started piano studies at the age of four, began performing at six, and directed his first musical project at 12. 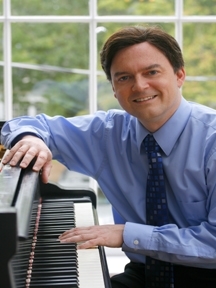 Mark received his Bachelor's Degree in Piano from Skidmore College and Masters Degree in Accompanying from UMASS/Amherst. He has been based at Mount Holyoke College since 1986 where he is a Senior Instructor in Jazz Piano, Director and Founder of the Mount Holyoke College Jazz Ensemble, and Music Department Staff Accompanist. Spotlight: Why do you enjoy working on "Mary Poppins"? Mark: I loved the film as a kid growing up, and it's fun to recreate that film live on stage. It's also the annual Community Show here, so I get to work with young kids, teenagers, college apprentices, and adults -- an unusual opportunity to create a multi-generational performance piece. Spotlight: Tell us about rehearsals. Mark: We start with a vocal and dance warmup, then I might teach a song, and my directing colleagues will choreograph or stage it. After several weeks and the end of the rehearsal process, we do full run through every night. We have been doing runs for a few weeks now. It's amazing to see the growth over time. Spotlight: Is “Mary” a musical just for kids? Mark: One would think so, but there's something in it for everyone. After all, at the bare bones, it's about a family that has lost its way. Mary teaches the adults to learn how to have fun, and the children how to behave more responsibly. And the song "Feed The Birds" is at the heart of the show: a plea for charity towards animals and other humans. Spotlight: What is the most difficult song? Easiest? Mark: Playing “The Game” is very difficult and can be vocally throaty. It's also quite the scary number -- the toys revolt after being treated badly. The easiest song, I think, is Supercalifragilistic... although the 'sign language' that the actors do is pretty intense. Spotlight: Who makes up your band? Mark: The band is a combo of professionals and teachers. We have a few members who have been in almost every community musical since they began. And we have a few newbies who are joining us for the first time. Spotlight: How did you get started in this work? Mark: I've always enjoyed 'show playing' (I had an affinity for playing musical scores) and learned how to do it myself, with no real mentors. Musical theatre is not as far removed from solo or choral singing as one might think. I've been fortunate to work in many genres -- I began with classical music, then branched out to jazz piano. Spotlight: What is your day job? Is it music? Mark: It is my day job! I consider myself pretty lucky. Spotlight: Any thoughts about the rehearsal process that are important? Mark: The only wisdom I'd like to offer is that the rehearsal process will go smoothly if everyone allows themselves to make mistakes. It's important to try things and take a chance. Great things will happen if one does this. For information about “Mary Poppins,” check www.berkshiretheatregroup.org.